Elections are cutthroat times. A local candidate is being forced off the ballot while you are reading this blog because it is the week before the election. In light of the fray, here is BeatTheChip’s hard-knocks election experience at the polls. Here is what happened to me when I went to vote. I voted early this election at a University campus. Some say early voting is not a good time to vote because they focus too much on the results and some votes get thrown out. Just know – I did vote. You may e-mail me[beatthechip@gmail.com]and perform an exit poll on who I voted for IN THE END. TRUE STATEMENT: Most states do not have voter ID laws. You only have to show a document (It could be a billing statement.) that shows your first and last name and an address. The poll worker then said, “Yes, you do!” I reiterated that there is no law in the State of Texas that mandates that I show him my ID. He then said, “Either that or a voter registration card.” Unfortunately, this is where I was duped. I didn’t need a voter registration card. As indicated above… all I needed was a piece of mail substantiating my residence. Great. Onto the next hoop jumping contest. “May I see your ID?” Annoyed, I handed the woman my California license. She immediately flipped over the back of the license and scanned the bar code on the back. I was really shocked when I saw this. She then whined and said, “Ohhh… it’s not coming up!” That would have been the only benefit, in this case, to having an out of state license that wasn’t recognized in their voter rolls system. NOTE: It is intended for you to make the connection that the DMV or DPS motor vehicle database codes and records were available in voter recognition programs. I then replied, “It’s alright. I know I wasn’t purged from the voter rolls. Would you like to enter my name so that I can vote?” Annnd ..countershock in 3..2..1.. with raised eyebrows she flipped my license back over and then punched in my name. Amazingly enough my name and Texas voter registration information came up. Both attendants then squirmed in their seat and licked their lips like nervous cats. One attendant had to resticker my name to the voter registration readout form because they weren’t used to this type of computer evasion. I just got lucky. Had I cao-taoed to any one of these people with a Texas state ID, every action I took during my voting experience would have been recorded. I then proceeded to the voter wheel-of-fortune where I dialed in my varied 3rd party campaign trail mix and then hit the red button. A woman who had voted in the booth next to mine began to pace back and forth behind me saying, “Is that right? Should I have to lose my vote because the machine didn’t recognize my candidate?” It was both distracting and disturbing. VoteRescue.org has great advice on what I did both wrong and right when I voted and how you can preserve your vote on electronic-election day. May you do better than I did. It’s really too bad we couldn’t hear more on the subject from her. In honor of citizens opposed to Obama, we decided to publish this. We propose that she is a better alternative for voters who would vote Democratic in the 2008 Presidential election on the platform of civil liberties, global warming, foreign policy and universal healthcare. Our reasons? The Democrats’ recent voting records on the Patriot Act, FISA, and extending the imbalances of both executive powers and those of appointed officials leave those with privacy and U.S. sovereignty issues out in the cold. The Green Party’s platform on adding limitations to commercial expansion for the sake of conserving the environment and human posterity is not popular with conservatives. However, it may steer us away from oil dependency. Including the environment in debate conversations are keys to Green Party policy, giving the honest American “a break”, and not insulting our intelligence about the state of domestic affairs or how we arrived at that place. We now turn to understanding the McKinney campaign and the U.S. struggle to redeem itself from the road to imperialized commercial extremism while trying to balance a rebound for the U.S. Constitution, a corroded infrastructure and a deadbeat economy. 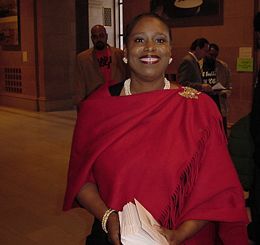 Ms. McKinney is Georgia’s first African American Congresswoman. Her ascension in the Executive chain of command has been frought with ..politics. We, the people who vote, share her contest with random demands on the American identity and our legitimate place in American politics.